An ancient Buncrana roadway uncovered by the August Flood has been described as ‘a very exciting discovery’. In the foreground is the remnants of an ancient paved roadway, uncovered near Castle Bridge in Buncrana during the August 2017 flood. The roadway, which fords the Crana River on the seaward side of Castle Bridge, is thought to pre-date the Plantation of Ulster and the local history society is convinced it was associated with the nearby O’Doherty Keep, home of Inishowen’s Gaelic chieftains, most notably Cahir O’Doherty. 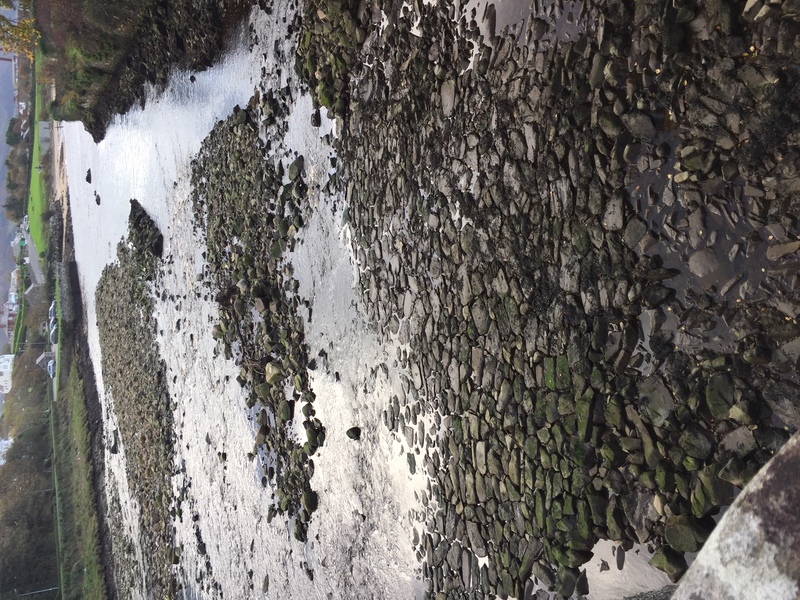 “These stones would have been placed by hand, to form a smooth, level road with which to cross the river at low water,” said John McCarron, vice chairman of the West Inishowen History and Heritage Society. “The direction of the paved ford, and the way in which the flat stones are arranged, suggest the ford ran from O’Doherty’s Keep to the area at the bottom of what is now Castle Avenue where the building known as ‘The Stone Jug’ now stands. The roadway is visible at low tide and best viewed from the ramparts of Castle Bridge. 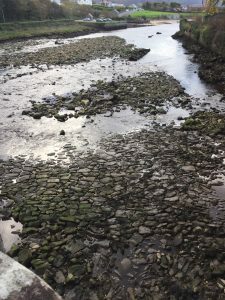 The flood on 22 August, ‘Oíche an Uisce Mór’, removed silt and sediment from the riverbed on the Crana to uncover the ancient roadway on which, as Mr McCarron says, it is easy to imagine Cahir O’Doherty’s carts and horses clattering over.